There's an outlet Laura Ashely shop in Antwerp. I needed to fetch some stuff for India's dollhouse project for school. Samples of wallpaper, paint and other smallables to create a complete doll house. I wanted to decorate a small part of my workspace with wallpaper for the longest time. Not completely sure I wanted a vintage design ; I wanted something special, demure, light to 'brighten' a small piece of wall to use as background for my models & pictures. 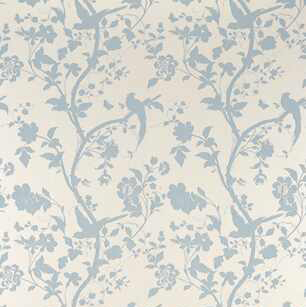 So here it is, something greyish blue with off white flowery design ; looks a bit like Japanese blossom. I like it. It's still packed but today I bought all required material to finally do the job. I am very happy with my instant glue. No need for a table or extra help(er) to hold my paper. Just stick it onto the wall and set the wallpaper. Fingers crossed this will work !